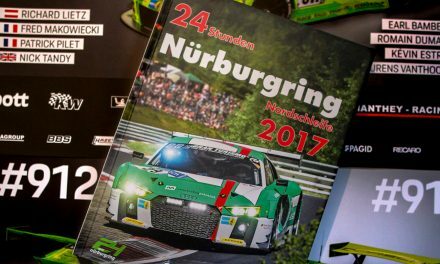 Grello on pole and its sister car next to it on the front row: it was business as usual for Manthey Racing on the grid of VLN2. 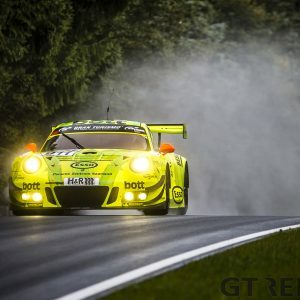 And for a long time it looked to be another Porsche 991 GT3R victory indeed. 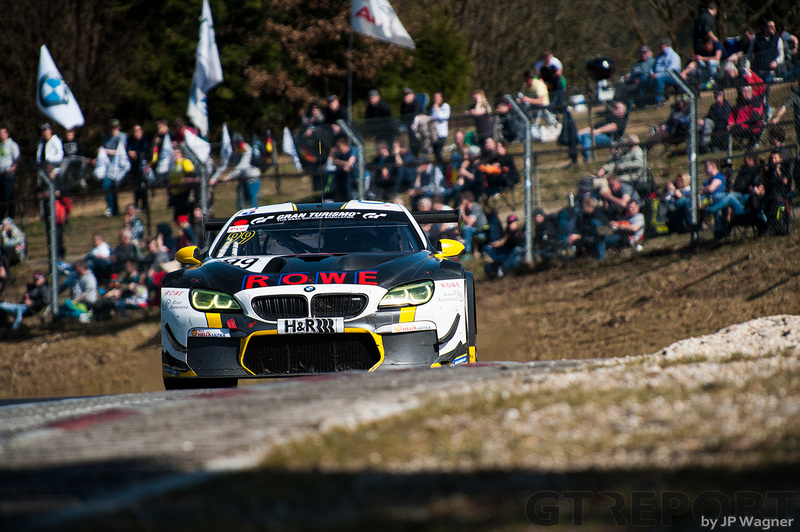 But lurking in the background was the number 99 Rowe Racing BMW M6 GT3. Slowly it became apparent that Rowe, not Manthey, were on course for victory. A beautiful Friday in the Eifel quick turned sour when Jesse Krohn smacks into the barriers. What should’ve been a useful afternoon setting up the car, becomes a long day and night of repairs for the Rowe Racing mechanics. The next morning, the mechanics push the BMW M6 GT3 to the eight slot on the grid. They’ve made it. Tired but full of spirit, the crew from St. Ingbert are emboldened to make today count. 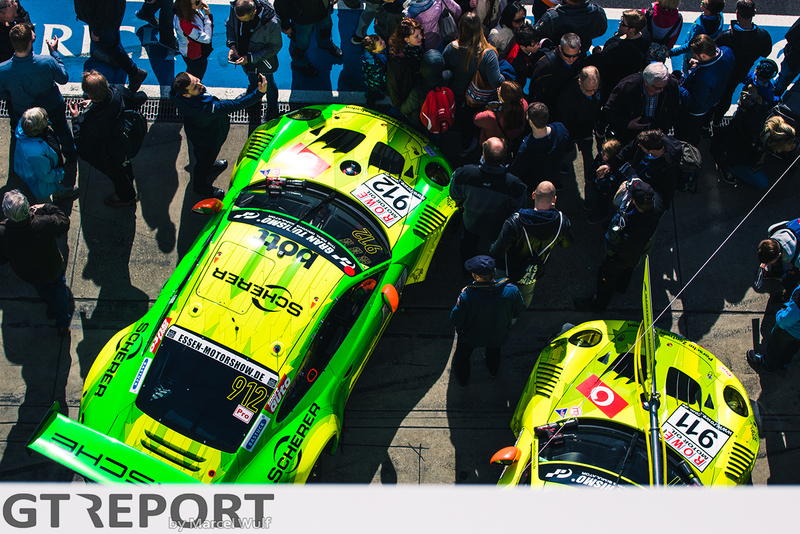 On the front row not one, but two neon-coloured Manthey Porsches are parked. 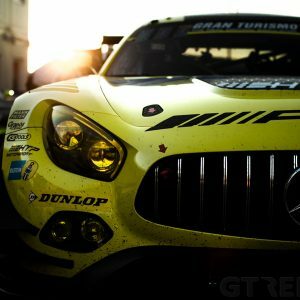 Together with the number 14 Black Falcon Mercedes-AMG GT3 they ducked underneath the 8-minute mark in qualifying to start the number 911 from pole with the 912 alongside on the outside row. Romain Dumas in the number 911 Porsche is off to the green flag a little too fast for team-mate Patrick Pilet to keep up. 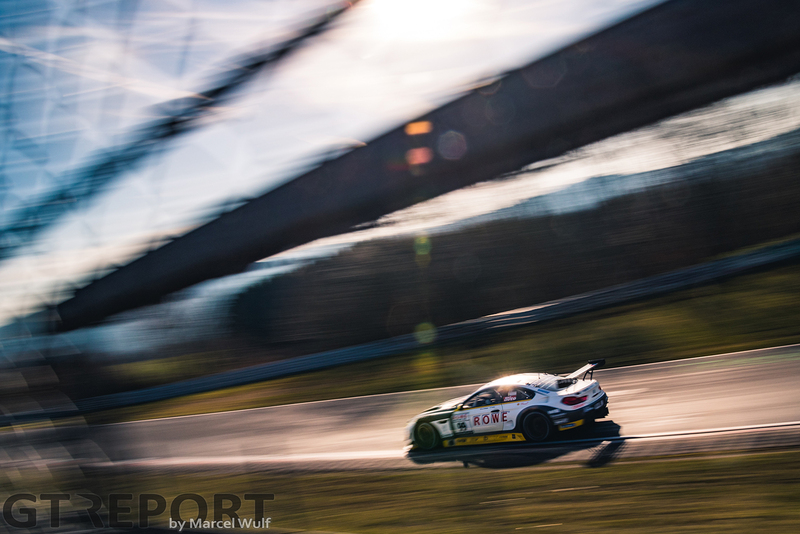 The Frenchman is swamped by Maro Engel in the Black Falcon AMG and Christian Hohenadel in the Mann Filter-themed number 48 HTP Motorsport Mercedes-AMG GT3. Engel gets past, but Pilet just manages to hold off Hohenadel. Two laps later the leaders, still running together in a small group of five cars, hit the first backmarkers. The very first car of the day Dumas has to lap does him no favours as he’s forced onto the grass when the two misunderstand each other. Engel doesn’t hesitate and takes the lead. 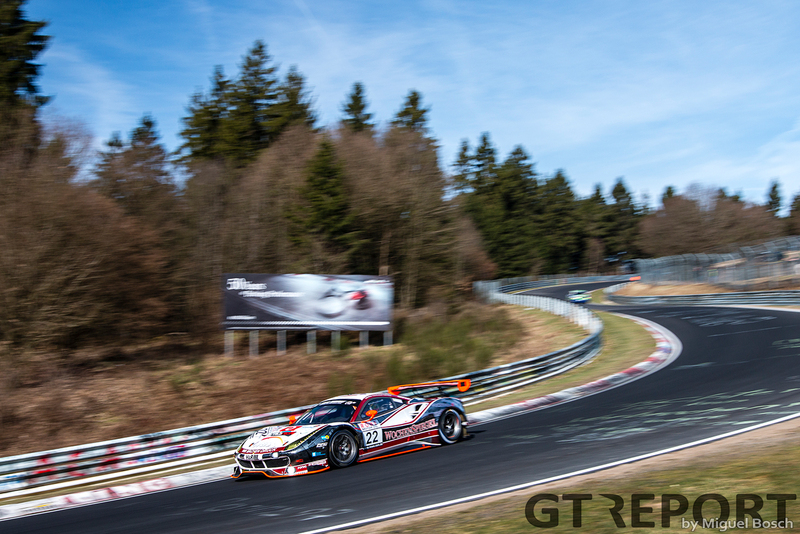 Pilet, who meanwhile has recovered from his poor start, also goes past the slowed down Dumas at Schwalbenschwanz and follows Engel onto the long Döttinger Höhe straight to complete the iconic slipstream pass for the lead. At the rear of the lead-pack Connor De Phillippi calmly trails, counting on his team to bring him forward by pitstop strategy. Five laps into the race Grello becomes the first of the contenders to make a pitstop. Manthey has decided to move the first pitstop for the number 911 forward to get the car out of the dense traffic. 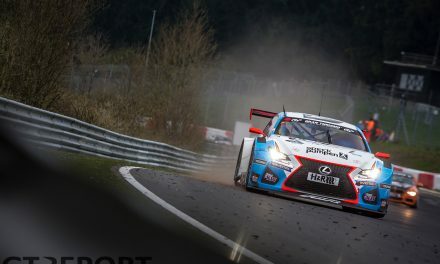 Laurens Vanthoor takes over from Dumas and sets course for the second and third stint. The rest of the leaders stop the next time by—all of them except De Phillippi, the American goes one lap further before he comes in for servicing. 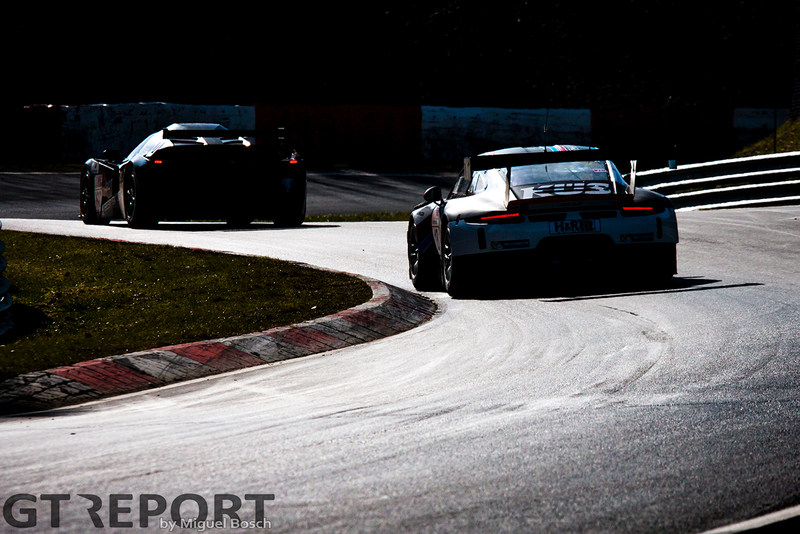 Manthey’s variation for the number 911 Porsche requires Vanthoor to start pushing. He needs to build a gap to stay in front after the pitstops. The Belgian works his way forward, not backing down for anyone. With an hour and half to go, shortly before his planned pitstop, he comes up to Galgenkopf to slingshot onto Döttinger Höhe when he loses control and hits the barrier. It’s not a heavy hit, but it’s enough to knock the splitter loose. Arriving in the garage, the Manthey crew assesses the damage to find not only a broken splitter but damaged fixations as well. With the 24 Hours of the Nürburgring around the corner, the risk to go back out is too big to continue and Grello is parked. 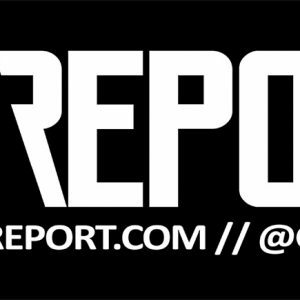 Adam Christodoulou at this point has taken over the lead. The Black Falcon pilot, the third man in the car after Maro Engel and Manuel Metzger, has dialed up the tempo of the race, but so has Krohn. The Finn has replaced De Phillippi after two stints in the BMW and makes every lap count. But somewhere along the second series of pitstops he’s lost a lot of time through Code 60 zones, dropping outside the top 10. Rowe, however, has one more trick up its sleeve: the closer they can push their final pitstop towards the end of the race, the less they time they need to spend waiting in pitlane. The team has seen the writing on the wall and adjusted their strategy to the heavy traffic and Code 60s early on in the hope of taking a shorter final pitstop. At the start of the final hour it’s time for Black Falcon’s final pitstop. Their pace today has been blistering and they look set to bring home the win. 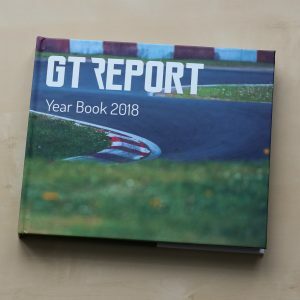 Both Manthey Porsches have been shaken off—the number 912 when pilot Nick Tandy spins trying to overtake the Mann Filter HTP AMG and then encounters sheer bad luck with Code 60s—and the Phoenix Racing Audi R8 LMS GT3 is held at arm’s length by Dirk Müller in the last stint. With each lap that passes, Krohn stays. Every minute that ticks by means his stop will be seconds shorter. Finally, after staying out until 33 minutes to go, the BMW veers off into pitlane. Seconds per lap have accumulated to over a minute won over Black Falcon simply by pitting almost half an hour later. When Krohn returns on track, he has jumped Müller’s AMG by 15 seconds. 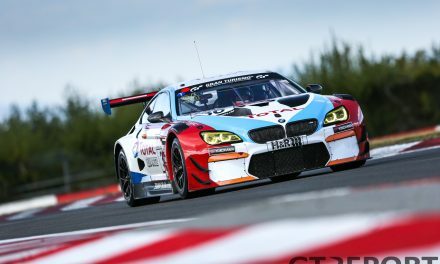 Despite a last-ditch effort by Müller to get close to the BMW, Krohn takes the chequered flag first, followed over the finish line by the Black Falcon AMG at 8 seconds distance. Klaus Bachler and Martin Ragginger in the Falken Motorsports Porsche 991 GT3R take the final trophy. 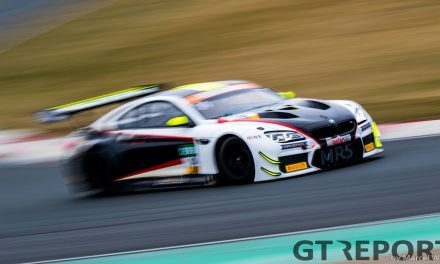 Having lost second place to the Mücke Motorsport Audi-team last time out due to a mix-up in a Code 60 zone late in the race, Bachler returns the favour to Audi by passing an unaware Marcel Fässler in the Land Motorsport Audi R8 LMS GT3 in traffic during the final minutes.